Casual, fun options for when you haven’t made things “official” yet. Keep things light at new Williamsburg bar Full Circle, where the Skee-Ball lanes and variety of cheap beers ($3 Gennesee Cream Ale, $5 Dale’s Pale Ale) provide ample entertainment. What could be more laid-back than pizza? Skip the slice joints and head to Motorino for a Neapolitan pie. Trick Camera Lenses ($8, Urban Outfitters), Polaroid Notes ($15, Fred Flare), The Kraken Black Spiced Rum ($20, Astor Center). Romantic picks, minus the standard cheese. The dim lighting and cozy nooks at Sasha Petraske’s White Star are perfect for couples, while the well-mixed, and sometimes deceptively strong, cocktails will keep the night moving along. Share some small plates at Sorella. 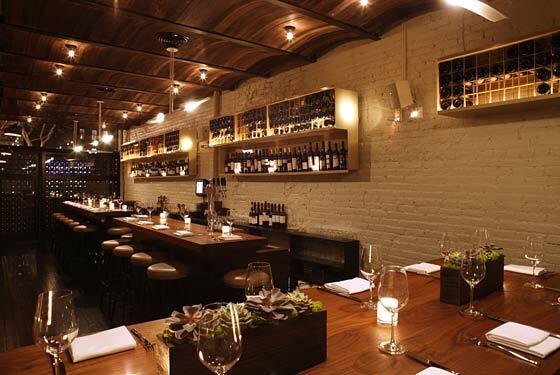 It may look like a wine bar, but chef Emma Hearst’s inventive Piedmontese menu holds its own. Two Hands Gnarly Dudes Barossa Valley Shiraz 2008 ($27, Hudson Wine & Spirits), Glamour Noir Unline Bra and Hipster by DKNY($38, Lord & Taylor), Red Heart Collection Chocolates by Payard ($40, Mauboussin). Classic New York elegance sets the backdrop for celebrating. Since Valentine’s falls on a weekend this year, Campbell Apartment won’t have the usual post-work commuter crowd. Sip Champagne near the fireplace and take in the Jazz Age touches in the décor—plush red velvet, wood paneling, and a massive stained-glass window. Indulge in some rich French cuisine at Adour Alain Ducasse. The extensive wine list and sumptuous desserts are especially suited for romantic dining. Pentagon and Hexagon Watches ($75, MoMA Design Store), Saint-Germain Chemise ($58, Anthropologie), Cigar Lighter by Sarome ($95, Takashimaya). Quiet spots for adult conversation—no kids’ menus or paper tablecloths. Stop by Whitman-inspired pub Henry Public for custom takes on classic cocktails and a decidedly grown-up saloon vibe. Bacchus may be a tried-and-true neighborhood favorite, but for very good reason. The menu of bistro classics is well prepared, the staff is friendly, and, most important, the atmosphere is mellow and relaxed. Sprout Love Arrangement ($125, Sprout Home), CLIQ With MOTOBLUR by Motorola ($150, T-Mobile), Ruler Cuff Links by Links of London ($190, Links of London). After 20-, 30-, 40-plus years, here’s where to splurge on each other. Get a table at Jazz at Lincoln Center for live music and drinks. Pianist-singer Freddy Cole will be performing classic American love songs with his Valentine Swing Band. You’ll be at the Time Warner Center anyway, so try for a reservation at Missy Robbins’s A Voce Columbus or go all out for the tasting menu at Per Se. Crocodile Cuff by Sarah Hearey ($175, Takashimaya), The Healy Tie by Jack Spade ($95, Jack Spade), TY KU White Sake ($110, Astor Center).